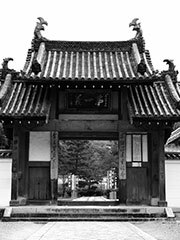 Mampuku-ji (萬福寺) is the head temple of the Japanese Ōbaku Zen sect. Founded in 1661 by the Chinese monk Yinyuan Longqi and his disciple Muyan, it is located at Uji, near Kyoto, and is built in Chinese Ming style. In 1664 control of the temple passed to Muyan, after many Chinese monks followed as head priest. Only the fourteenth and later priests are Japanese. The arrangement of buildings follows Ming Dynasty architectural style, representing an image of a dragon. The temple’s main statue is a seated Gautama Buddha. Sculptures by the Chinese sculptor known as Han Do Sei and patterned balustrades can also be seen. The temple treasure house contains a complete collection of Buddhist scriptures completed in 1678 and comprised of approximately 60,000 printing blocks, which are still in use. The production of the printing blocks was funded by donations collected throughout the country for many years.